Beautiful city of Dubrovnik is among the most popular stops on most Mediterranean cruises. This historic city gives opportunity to enjoy a sunny weather, explore historic sights, sunbath on beautiful beaches and taste delicious food and wines. Once transfered from the cruise port to the Old Town first you need to take a walk along the most beautiful street - Stradun. This marbled street is a central spot of the Old Town. Take a stroll down the Stradun and get losts in the crowd of tourists and locals. Along Stradun you will find nice outdoor cafés where you can have a coffee while watching people pass by. Ones you soak up the atmosphere it's time to explore Dubrovnik. 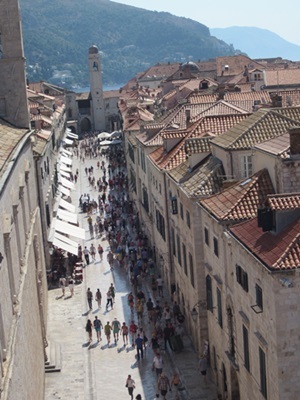 Head to the beginning of Stradun street, climb the stairs to city walls and enjoy interesting walk the rest two hours. Walking along the walls is great for exploring the sights from different angle. You will enjoy amazing views over city roofs, Adriatic sea, squares, palaces, narrow streets and nearby Lokrum island. If you are interested in Dubrovnik's turbulent past you should take one of numerous guided tours offered in Dubrovnik and in the company of a guide explore Dubrovnik. Taking the cable car to the top of Mount Srdj above Dubrovnik is a great if you would like to take amazing photos of the area. In only few minutes you will find yourself on the top of Mount Srdj and enjoy stunning views of the city and nearby islands. Once you are back to the town you can visit one of the several museums, numerous churches such as Church of St Blaise, Sponza Palace, Rector's Palace, art galleries. When in Dubrovnik you shouldn't miss delicious Dalmatian made of local ingredients - vegetables and fruits grown in the countryside and fresh fish from the Adriatic sea. These authentic dishes, simple but tasteful, are served in many restaurants within the city walls as well in Lapad and Gruz area. For those who want to relax there are numerous beaches with crystal clear water in Dubrovnik. The most popular beach is Banje beach, close to the Old Town. The sea in Dubrovnik is perfectly clean and enjoyable for swimming from early May until late October. So don't forget you swimming suit! If you are looking for a unique Croatian souvenir you will find them in several souvenir shops. You can choose from local olive oil, cheese, dried ham ("prsut" in Croatian), jams and marmelades, candied orange peel, sugared almonds, natural soaps and essential oils, salt from Ston and Pag, Croatian chocolates made by "Kras" etc. There is a lot to be explore beyong the city itself. Dubrovnik's countryside is filled with villages offering authentic experience. In Konavle region, which is situated southern of Dubrovnik, you will find village of Cilipi where you can see local costumes. In the northwest of Dubrovnik there is a Peljesac peninsula and town Ston which is famous for salt production and oyster growing. Peljesac is a area where people grow grapes and made wines. There you can take an organized tour and visit great wineries and taste delicious wines.